As we start a new year I will pause to express my thanks to those who have supported me over the years that I’ve been pounding out my column. Of course, those on top of the list that I offer my “Domo arigato” to are folks at the Rafu. That would be Publisher Mike Komai for letting me hang out for over two decades at the Rafu. Then, of course, Editor Gwen Muranaka and her staff for their assistance, especially Maggie. And in the business office, Executive Yoko-san, Michelle and Seiko-san. Away from the Rafu, topping those I want to say thanks to is George Wakiji of Camarillo, who has contributed so much in assisting me in grinding out my chatter. Then there’s Supervisor Mike Antonovich, who is always there when I need some political punch. Helping me keep my ties with Nisei Week, former queen and long-time friend Em Kato Yamada. Helping me to remember the good old days of Little Tokyo, Tak Hamano of Umeya Company. 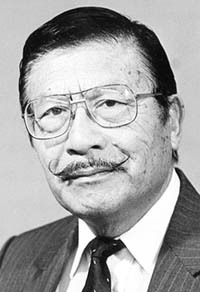 The guy I call my “Las Vegas connection,” Al Morita. Of course, one of these days, before I retire there are a lot more names I have to publish on my “thank you” list. Unfortunately, many of them will have “the late” before their names because they have passed away. As always, I have to thank all those who read my stuff and encourage me to keep going. Well, I guess it’s time to get on with today’s column. Since we’ve been relaxing over the holidays for a week, I’ll have to shift gears to get my brains moving again. As a starter, I thought I would toss in a piece given to me by friend Ed Fukumoto entitled “The Seed.” It’s a good philosophical piece to start the new year. It goes: “A successful businessman was growing older and knew it was time to choose a successor for his business. “Instead of choosing one of his directors, he decided to do something different. He called all his young executives in his company together. “One man named Ichiro was there that day and he, like the others, received a seed. He went home and told his wife the story. She helped him get a pot, soil and compost and he planted the seed. Every day he would water it and watch to see if it had grown. After about three weeks, some of the other executives began to talk about their seeds and the plants that were beginning to grow. “Ichiro kept checking his seed, but nothing ever grew. Three weeks, four weeks, five weeks went by, still nothing. “By now, all the executives were talking about their plants, but Ichiro didn’t have a plant and he felt like a failure. “”Six months went by, still nothing in Ichiro’s pot. He just knew he had killed the seed. Everyone else had tall plants, but he had nothing. Ichiro didn’t say anything to his colleagues. However, he kept watering and fertilizing the soil. He so wanted the seed to grow. “A year finally went by and all the young executives from the company were asked to bring their plants to the CEO for inspection. “Ichiro told his wife he wasn’t going to take an empty pot. But she asked him to be honest about what happened. Ichiro felt sick to his stomach. It was going to the most embarrassing moment in his life, but he knew his wife was right. He took his empty pot to the boardroom. When he arrived he was amazed at the variety of plants grown by the other executives. They were beautiful. Ichiro put his empty pot on the floor and many of his colleagues laughed. “The CEO asked everyone to sit down except Ichiro. He looked at him and then announced to the young executives, ‘Behold your next chief executive officer.’ Ichiro couldn’t believe it. “‘How can he be the new CEO?’ the others asked. Then the CEO said, ‘One year ago today, I gave everyone in this room a seed. I told you to take the seed, plant it, water it and bring it back to me today. But I gave all of you a boiled seed. They were dead. It was not possible for them to grow. • If you plant honesty, you will reap trust. • If you plant goodness, you will reap friends. • If you plant humility, you will reap greatness. • If you plant perseverance, you will reap contentment. • If you plant consideration, you will reap perspective. • If you plant hard work, you will reap success. • If you plant forgiveness, you will reap reconciliation. So be careful what you plant now, it will determine what you reap later. A good thought to begin 2012. Yeah, it’s time to ask the same old question at this time on the calendar. That is, how many of you kept the resolutions you made when flipping the calendar from 2010 to 2011? How many of you made resolutions for 2012? Did I make any resolutions? Yeah, one was to cut back my trips to Vegas. But that isn’t going to last too long because I’m planning my next trip for the last week of January. Well, I’m glad I wasn’t in Vegas over the past New Year’s Eve. A friend just got back and he said it was the most crowded New Year’s Eve he’s ever experienced in Vegas. Well, I guess so, because according to reports in the media, Vegas had the most visitors this past New Year’s Eve than ever. A total of over 400,000 were said to have celebrated there. That’s a lot of people, even for Vegas. I had to watch the Rose Parade this past Monday because I wanted to see the Japanese high school band that the Rafu mentioned in one of its editions. Since they were scheduled to appear in the No. 53 spot, I had to wait quite a while before they appeared on the tube. In the meanwhile, I noticed a large number of “Asian” faces going by on floats and in the many bands going down Colorado Boulevard. Kind of reminded me of the time I rode on a float in the parade. I guess it was about 60 years or so ago. I played the role of a Chinese emperor and was accompanied by the late Patty Hishiki, who played the role of a Chinese empress. We both wore Chinese costumes. I guess I wrote about this experience a few times over the years. Needless to say, riding on a float in the Rose Parade was one of the memorable events in my lifetime. I’m sure the people around the person shouting such words were wondering who he was yelling at. Since there are so many people jammed along the street, it was hard to look over to see who it was that was yelling at me. I mean, how many Chinese emperors are named “Horse”? I had some photos taken on the float, but I couldn’t find any of them. I wanted to include at least one since I’m writing about the experience — and it was an experience. I had to leave Gardena at 3 a.m. to get to Pasadena in time to prepare for the ride and I learned a lot about people who do participate in the event. For one thing, they cautioned me not to drink too much fluid the night before the parade. You can guess the reason. No place to go shi-shi once a person climbs on the float. Since the entire parade from start to finish takes about four hours, you can imagine what that means, especially if it’s cold as it usually is in January. This year, the Rose Parade time felt more like mid-summer. With thousands of participants in the Rose Parade, you can be sure at least a handful had to “five-four-four” (go-shi-shi). I guess I get a chuckle that in this day and age of high technology, Editor Gwen has to drop by my house on Mondays and Wednesdays to pick up my column. It used to be that I would send my column by fax but the transmission by this method went out of whack, so Gwen, who fortunately lives in Gardena, picks up the column and hand-delivers it to the Rafu. If Gwen didn’t live a few blocks from me, I would probably have to drive to J-Town to deliver it myself. Hopefully, we can get the situation ironed out soon. Needless to say, a surprising number of Nisei are hitting the 100-year mark in age. At least a lot more Nisei are reaching that mark than our Issei parents did. So, what’s the reason for more Nisei reaching this age? No. 1 is lifestyle (whatever that means). No. 2 is family history. Faith is ranked No. 3 and 9 percent luck. He wrote: “Happy New Year of the Dragon … tatsu doshi. “I think I asked you before, but what year were you born? Is dragon the year of your birth? (No, Ted. I’m an ox). “I hope you are feeling better as you mentioned that you were in the hospital Christmas Eve. “Did you eat traditional Japanese New Year foods: Osechi ryori like ozoni, kasunoko, toshi-koshi soba, etc.? “Or do you go to McDonald’s as I know they are open on New Year’s Day? Ha, ha. “This year we ordered from a Japanese lady who cooks osechi ryori and delivers it to us. “In fact, we ordered from her for Christmas dinner since we were the host, we ordered prime rib, ham, scalloped potato, etc. The food was excellent, delivered all ready to eat, no need to warm up anything. “The guests and we all enjoyed it. It reminded me of being back in Japan, when we used to call the places and they would deliver to us. It sure makes it easy for lazy people like me. “We also got a cake from a Chinese bakery for dessert. I don’t know about your neighborhood, but here in San Gabriel Valley there are so many Chinese bakeries, it’s very hard to tell which ones are good. The majority of them have Taiwanese owners and the cakes not very sweet, which I prefer. “It appears that Chinese people go out to eat rather than have family gathering at home on Christmas. “Speaking of 2011, I went to Vegas three times. How about you? How many times did you visit the ‘one-armed bandit’ city? “I think you mentioned that they opened a Japanese restaurant in the Union Plaza Hotel. If you did, was it better than Makino’s? “I went to Makino’s in September and was a little disappointed with one thing. “Their miso soup. I noticed they put chopped up cold tofu in the soup. Since the tofu is cold, they never get warmed up even though you dump them in the hot soup. I’ve never seen this before when the tofu was always in the soup. “Other than that, the food at Makino’s was excellent, especially the sashimi and sushi. “I hear they are planning to open a Makino’s in Irvine this spring. Certainly looking forward to that. Thanks for your letter, Ted. I want to add to the thanks that Makino’s now has an automatic miso soup machine. I haven’t seen anything like it at any other Japanese eateries I’ve visited but it’s really a unique device. So I think a lot of other Japanese restaurants will be installing it. I would guess it’s been imported from Japan. • I did not know this but when you drink vodka over ice, it can give you kidney failure. • When you drink rum over ice, it can give you liver failure. • When you drink whisky over ice, it can give you heart problems. • When you drink gin over ice, it can give you brain problems. Apparently, ice is really bad for you. Heh, heh. George Yoshinaga writes from Gardena and can be reached via email. Opinions expressed in this column are not necessarily those of The Rafu Shimpo.